UMA Solar Blog: Sustainable Solar Art! An Alabama artist's unique style is currently showcased in a new, 15-foot solar-powered sculpture in downtown Clearwater, Fla.
Deedee Morrison, a Birmingham, Ala. sculptor and installation artist, dubbed the sculpture Sun-Catcher. 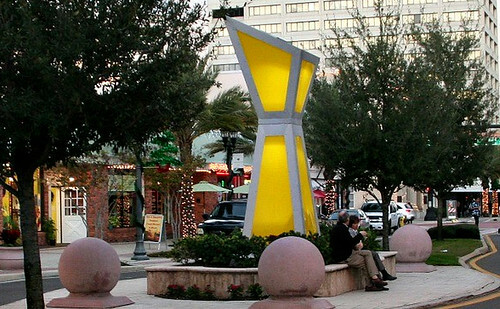 The large art project is constructed from recycled aluminum and vibrant yellow lucite that evokes hues of the sun. A solar panel is attached to the top of the sculpture, capturing solar energy by day and emitting dramatic golden light by night.